There are those who profess to be restorers and then there's Matt. A real craftsman. It’s obvious from the minute you enter his workshop that there's something very special going on here. You only have to look at the machinery, his tools, how the workshop is laid out. This isn’t just a garage where cars are fixed, this is a space where real old school work takes place. There’s a real obvious piece of equipment in the workshop for those of you who know a little about restoration work and that is Matt’s English Wheel. Only used by a truly skilled individual. Need I say more. Matt started as an apprentice back in 1984 working for a historic sports car company. It was there that he learned traditional methods of hand building car bodies and chassis. He was taught to use heavy machinery such as lathes and milling machines and in addition to that he also found time to study mechanical engineering. Matts career continued on and as he gained more experience within the automotive trade he was given the opportunity to work on high-end racing cars such as Jaguars: C-Types, D-Types and Lightweight E-Types. In 1999 he went to work for CKL Developments panel beating accident damaged race cars. CKL is now one of the most prestigious classic car restoration companies in the world! In 2007 Matt started his own business, Airkraft, great name. 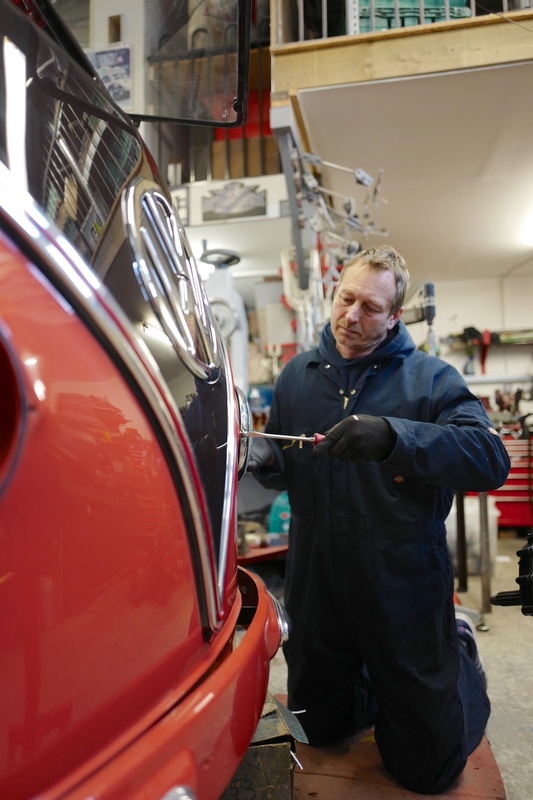 He now restores, reengineers and re builds classic cars. “A typical day at Airkraft is very varied”. His day might comprise of servicing an old VW camper van or it might involve making a set of wings for a pre-war sports car. He loves the variety and he loves the challenge of hand making parts for people's pride and joy. I’ve known Matt for a number of years and every time I’ve visited his workshop, I get educated. I might not understand everything Matt tells me, whatever he’s currently working on but what I do know, is there’s certainly no compromises on the quality of work he produces.